Translocation of “individual” MWNTs-NH3+ across porcine brain endothelial cells membrane. Images acquired using the STEM detection system on the Magellan HRSEM at 20 kV. A paper published in Biomaterials studies the interaction of carbon nanotubes and the blood-brain barrier. It was carried by the Institute of Pharmaceutical Science at the King's College London. Elzbieta Pach and Belén Ballesteros, members of the ICN2 Electron Microscopy Division, participated in the electron microscopy characterization studies. The study investigates the ability of amino-functionalized multi-walled carbon nanotubes (MWNTs-NH3+) to cross the blood-brain barrier (BBB) via two paths: in vitro using a co-culture BBB model comprising primary porcine brain endothelial cells (PBEC) and primary rat astrocytes and, in vivo, following the systemic administration of radiolabelled f-MWNTs. The study carried out at ICN2 has corroborated the results and offers better understanding of the processes. 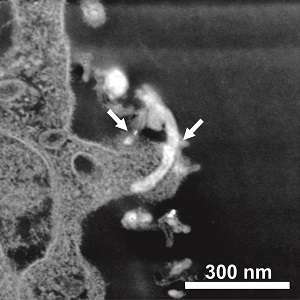 Images by transmission electron microscopy (TEM) and scanning transmission electron microscopy (STEM) showed that the cells or the tight junction assemblies were not damaged, that the interaction of MWNTs-NH3+ and the plasma membrane of the endothelial cells took place after four hours of incubation and confirmed that MWNTs-NH3+ crossed the PBEC monolayer via energy-dependent transcytosis. Also, high resolution TEM (HRTEM) and electron energy loss spectroscopy (EELS) showed that the graphitic structure of the MWNTs-NH3+ was preserved following uptake into PBEC. Researchers were able to demonstrate, for the first time, the ability of MWNTs-NH3+ to cross the BBB in vitro with low voltage STEM imaging, thus providing solid evidence using electron microscopy for each step of the transcytosis process. This research also stands out because its results could lead to the use of CNTs in new applications. For instance, they could work as nanocarriers for delivery of drugs and biologics to the brain, after systemic administration. How biodegradeable are they so that they don't become disease causing agents too? We know CNT produce asbestos like results in the lungs. How these nano tubes will be neutralize by the immune system of the organism and can they successfully disposed of it? Since there is no such structures in living organisms, is seems crazy to do such experiments? Our foray into the world of nano-carbon is fraught with dangers as well as benefit. When we tested carbon fiber materials used in aircraft, they produced tiny needles of carbon when burned. These ablate in diameter until they are sub-micron, are opaque to RF, and conductive. When they are deposited on insulators they short them out. Sub-micron particles are respirable, and can lodge in the lungs. If we have an aircraft (or carbon car) fire, the smoke may take out communications and radar.